LAWRENCE — An interdisciplinary team of students from the University of Kansas schools of Business and Engineering is working to revolutionize the wind turbine as they prepare for a prestigious national competition this spring. KU is one of 10 colleges in the nation selected for the inaugural Collegiate Wind Competition, sponsored by the U.S. Department of Energy. The competition will be May 5-7 in Las Vegas. Teams are challenged to construct lightweight, portable wind turbines intended to power small electronic devices. The competition is held in conjunction with American Wind Energy Association’s Windpower 2014 Conference & Exhibition. “It’s been a great learning experience for the whole team, especially with this being the first year of the competition,” said Katrina Legursky, who served as project coordinator during the fall semester and earned her doctorate in aerospace engineering in fall 2013. She is now employed at Applied Physical Sciences in Connecticut. “The requirement of forming an interdisciplinary team has been a real benefit. Having business students and engineers from several disciplines work together has helped ensure that our project isn’t just some cool design but also has real-world applications,” Legursky said. The project is part of an aerospace senior capstone structures course taught by Rick Hale, associate professor of aerospace engineering and project principal investigator. It also involves students in senior design courses in mechanical engineering, plus business, marketing and entrepreneurship courses in the School of Business. A total of 31 business, mechanical engineering and aerospace engineering students made up the fall semester team, with 10 participating in the spring. “It’s clear that the organizers of this competition are not just looking for engineers trying to solve a problem. They’re looking for a group of people with a business and marketing focus, so we’re approaching this like we’re a company rather than a group of students, which gives us better insight and more of an edge,” said Julian McCafferty, team CEO and senior in aerospace engineering. 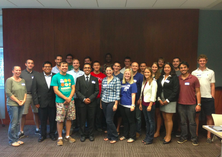 The students have formed a company, Jayhawk Windustries, and are operating on a business model to manage the project. They bill student hours, assign salaries and track all expenses in order to ensure the costs of producing their wind turbine are as realistic as possible. “The best scenario is that we come up with an awesome design that’s feasible and scalable, and after graduation we could actually form a company and start producing. Obviously, that’s the dream, but this is a great way to start,” McCafferty said. While the rules of the competition call for the wind turbine to be small and portable, teams have the option to scale up their design. After crunching the numbers, Jayhawk Windustries concluded they’d have trouble selling this size of turbine because of the expense of each unit. Producing a larger turbine presents an additional challenge. Teams must travel to the competition with a life-size prototype of their design. It doesn’t have to function, but the team has to figure out how to get it there and display it. In addition to their full-scale prototype, which will have a rotor about 6 feet in diameter, the team must test a separate, smaller model in a 17-inch by 17-inch wind tunnel at the competition. They are also judged on a detailed business plan and a presentation on the benefits of wind energy. “The competition is coming up quickly, and our team has been working hard to ensure we make a strong presentation. There are a lot of challenges and a large learning curve to this project, but we have been able to overcome a lot of these obstacles, and we are extremely excited to present our work in May,” McCafferty said. Follow the team’s progress throughout the semester on Facebook.